Growing up on a farm in Morgan, Utah, Easterns Rashel Blazzard, also known as Blazz, was raised with eight siblings. She learned to be a hard worker, dedicated, get the job done, and is an exquisite team player. Grateful for the work, Blazzard says her parents are easily the largest influence on her life. “They have taught me work ethics, attributes and examples.” Blazzard loved the farm life and hopes she is able to live on a farm when she settles down. In the midst of Winter Olympics, Blazzard says she enjoys watching ice skating. She notices how much control they have, and the technique and practice that has to go into it. It is the little things that catches her eye in this difficult sport. Blazzard transferred to USUE after one year at Westminster and from a Church of Jesus Christ of Latter-Day Saints mission in Panama, Panama City. She is a great asset to the team and leads the team with confidence. 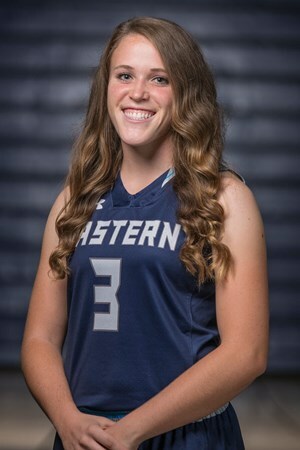 She averages 7.5 points, 3 rebounds, and 2.8 assists per game and was recently named USUE Player of the Week. Another outstanding stat Blazzard has earned is her 88.6-free-throw percentage. Being a selfless person, if she was given one million dollars, she would split up the money between everyone in her family. She would then help her parents pay for their LDS mission and with what was left over, pay for her schooling and a new car. If money and time weren’t an issue, Blazzard would pick up some adventurous hobbies such as scuba diving, zip lining, skydiving, becoming a food critic and traveling around the world. She thinks it would be fun to become one of those people who travel around the world and video their trip and experiences plus get paid money to do it. If she could send a letter to her younger self, she would want to say something simple. “Listen to your mother, be a little kinder, and never grow up.” Blazzard is a hard worker who is a joy to be around, so make sure you take some time to get to know USUE’s point guard.